Barring last-minute changes, members of the new Netanyahu government are set to sign final documents Thursday evening. Here's the lineup. Lapid, who fought hard to wrest control of the Education portfolio from Likud, added an apology for “the long silence,” writing that “every word would have had too many interpretations and spins. “After we sign the final document (probably tonight) I’ll update and explain, but it was important to tell the Facebook community of Yesh Atid (There’s a Future) I am still here and will continue to be here, because our dialogue is part of the new politics where elected officials do not close the door and leave the day after receiving their position. Thank you for all the support, and thank you for caring,” Lapid wrote. Lapid has won the post of Finance Minister. The party’s Number Two, MK Rabbi Shai Piron, will take the Education Ministry portfolio – ending a week-long battle with the Likud over the post. Another issue that had stalled the agreement was the question of military and national service by hareidi-religious students – a point that at the end, halted participation in the coalition by the Shas and United Torah Judaism parties. MK Aryeh Deri, co-chairman of the hareidi-religious Sephardic Shas party, commented however that it is now obvious that the “equal sharing of the burden,” as the issue was referred to by the Yesh Atid - Bayit Yehudi (Jewish Home) bloc and by Prime Minister Binyamin Netanyahu, was a red herring – and the real goal was to eliminate the hareidi-religious parties from the coalition government. Deri told Voice of Israel radio Thursday morning that Shas and UTJ representataives support the draft for hareidi-religious students who don’t learn in yeshivot. Last year, he said, a record number of 3,000 such men enlisted in the army. Deri added that he viewed Piron’s appointment to the Education Ministry in a positive light for the hareidi-religious sector. 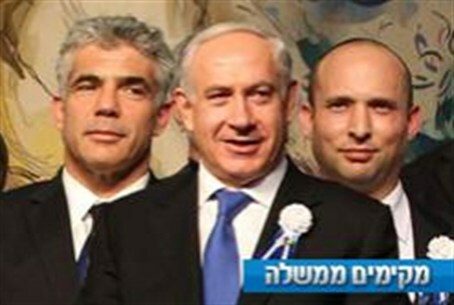 Yesh Atid Mks Meir Cohen and Yael German are to become Social Services and Health Ministers, respectively, with Yaakov Peri as Science Minister and former military reporter Ofer Shelach to become deputy Defense Minister. The Foreign Ministry will remain with the Likud, held in abeyance for Yisrael Beytenu chairman Avigdor Liberman pending the outcome of legal proceedings against him in accordance with a promise made by Prime Minister Binyamin Netanyahu. Likewise, the Interior Ministry will be held by the Likud. Bayit Yehudi (Jewish Home) chairman Naftali Bennett will become Vice Premier, and his party is to be given three portfolios. Bennett is to be appointed Minister of Economy and Trade – the new name for Industry, Trade & Labor – in addition to the Ministries of Diaspora and Jerusalem, and an expanded Religious Services Ministry that will include authority over the chief Rabbinate, supervision over yeshivot and conversions. Bayit Yehudi MK Rabbi Eli Ben Dahan will become Deputy Minister of Religious Services – a move that maintains the low count of ministers in keeping with the coalition deal made with Yesh Atid. Hatnuah, led by MK Tzipi Livni, will hold two portfolios, as promised – Livni to become Justice Minister, and Amir Peretz to be appointed as Environmental Protection Minister. Immigration and Absorption Minister Sofa Landver of Yisrael Beytenu is to maintain her post.